This is a picture of an and eagle I created in Photoshop back in 1999 just using the elipse tool. This falls inline with the Wile E Coyote sketches that are in the Sketch Work section. A piece of flash animation so I could do some lip syncing. A piece of stop motion animation I created. I also created the model/puppet that I animated, stiched his clothes and everything. The walk cycle is a bit fast but this is my first attempt. This was for a class at Uni where we had to animate how something worked. I chose a jet engine as I thought there were some challenges in here like creating fire. This was created using Lightwave 5.5. All models were created, animated, lit, shaded and rendered by myself. This is the first piece of animation I ever created. It was for a class at Uni where we could do anything we wanted and I tried to create a BBC2 style Advert. This was created using Lightwave 5.5. All models were created, animated, lit, shaded and rendered by myself. Above is a sketch from my Art Foundation Days for a project entitled: Bury My Heart at Wounded Knee, and was taken from the photograph below (by Edward Curtis) of Kyaiyi-stamik (Bear Bull), a member of the Blackfoot Nation, Alberta, 1926. It was part of Edward Curtis's The North American Indian Collection (graphic material). 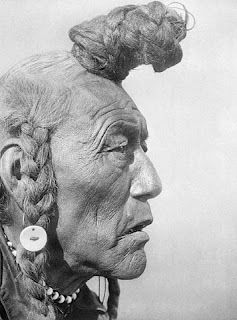 Curtis states: "One of the principal Blackfoot informants was Kyaiyi-stamik, Bear Bull, also called Sotai-na, Rain Chief, born 1859 between Battle River and Sakatchewan River.". Unfortunately at the time I never kept a copy of the photo I used for my drawing or who the photographer was, so it has taken me until now, almost 18 years later and what feels like just as long doing internet searches, to find it (found on http://www.collectionscanada.gc.ca). Wow just found this. 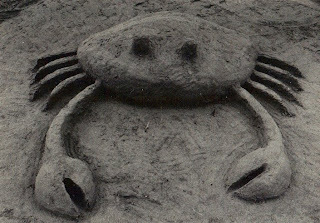 This is a sand sculpture I created on Weston-Super-Mare beach with James White, back in September 1996, when we were both at Art Foundation. This was a first day getting to know each other exercise where we had 30 minutes to sculpt anything and had to partner with somebody we didn't already know. Can't remember why we chose a crab though. Great days!